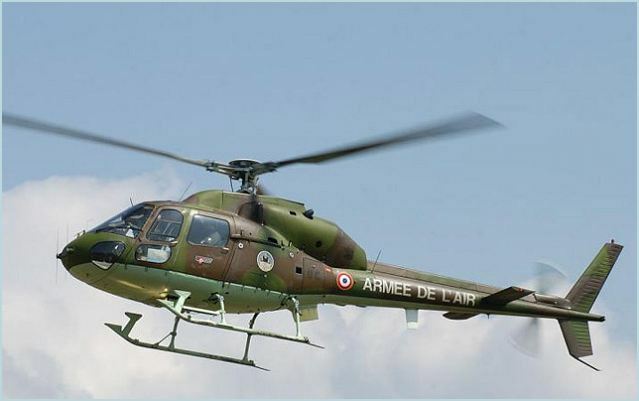 The AS550 Fennec is a light multipurpose helicopter, developed, designed and manufactured by the French Company Eurocopter. The AS550 Fennec is Eurocopter’s 2-ton class answer to Armed Forces requirements. 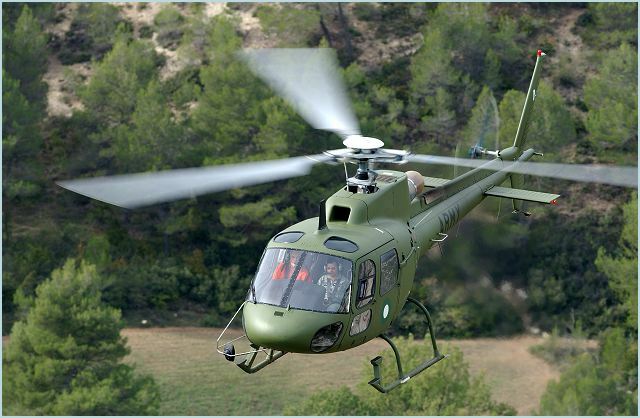 Easy to operate in extreme and harsh conditions, this Armed Scout helicopter combines safety and performance. Incredibly manoeuvrable and agile, the Fennec is perfectly designed to perform combat flight (nap of the earth - NOE). The Fennec is naturally stealth and NOE increases its protection against military threat. This Scout helicopter is suitably involved all over the operational spectrum thanks to its Stand Alone Weapon System (SAWS). The SAWS provides the capacity to rapidly mount or dismount any kind of weapon on its strong beams. 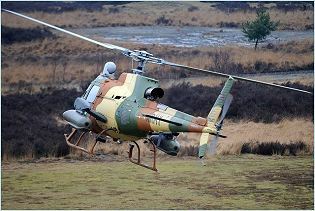 The Fennec AS550 also proves to be a stable firing platform at night and day. - AS350 L1/L2 Ecureuil: Original military variants of AS350. 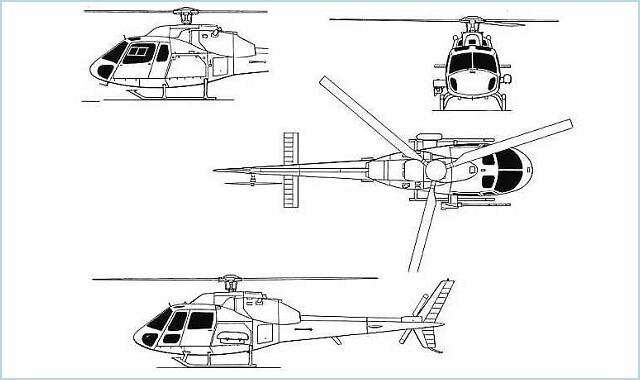 - AS550 C2 Fennec: Armed version based on AS350 B2. 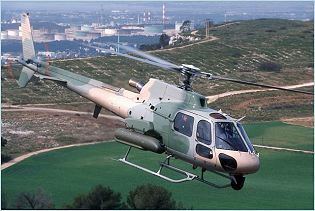 - AS550 U2 Fennec: Unarmed version based on AS350 B2. 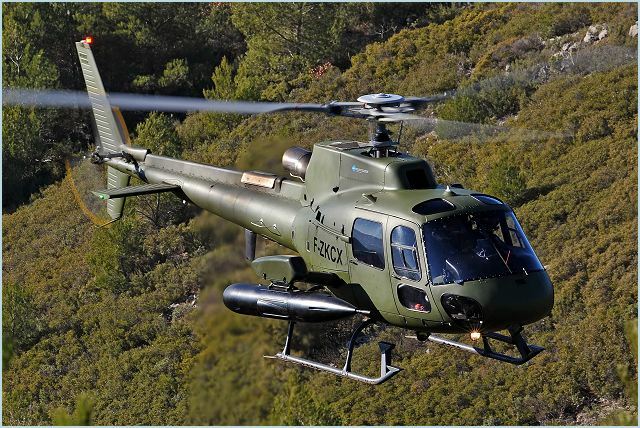 - AS550 C3 Fennec: Armed version based on AS350 B3. 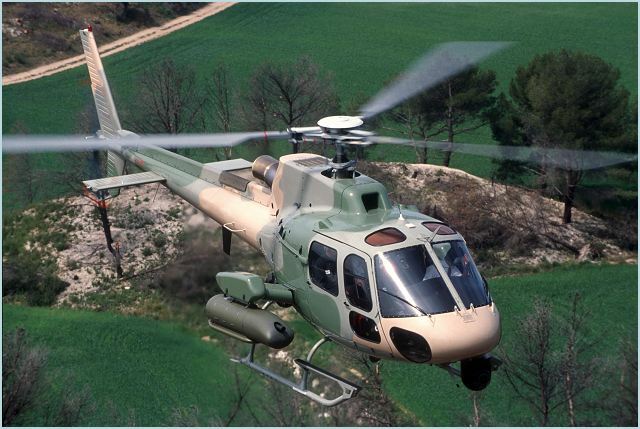 The AS550 is of light construction based on a reinforced high-strength glass fibre and aramid airframe. The Starflex main rotor head and blades are also of composite materials for added strength and weight reduction. The engine cowlings are armoured for protection. The AS550 is fitted with armoured seats and can carry the pilot and up to five troops. The cabin can also be configured for medical evacuation with capacity for one stretcher patient and two doctors. For cargo carrying, the cabin can take a 3m³ load. 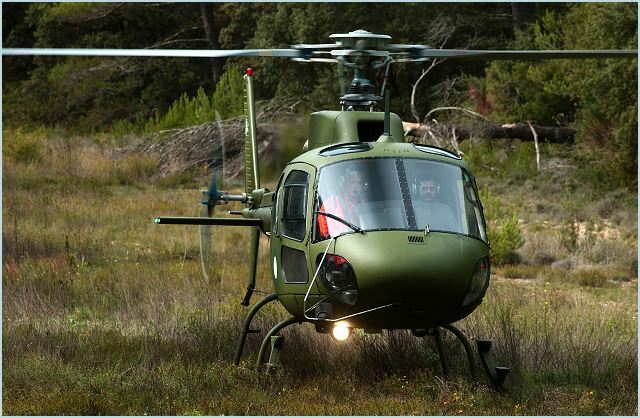 The military AS 550 is fitted with sliding doors on each side rather than the hinged door fitted on the civil AS350 variant. The 1m³ baggage compartment is installed behind the main cabin and is accessed via a door on the starboard side. The cockpit is equipped with single controls and is night-vision compatible. The navigation suite includes a global positioning system (GPS), a VHF omnidirectional radio ranger and instrument landing system (VOR/ILS), an automatic direction finder (ADF), distance measuring equipment (DME) and a marker beacon transponder. The secure communications systems are fitted according to the customer country's specification. The pilot has a vehicle and engine multifunction display which allows shows the main vehicle and engine parameters on a dual LCD screen. Fitted with a powerful TURBOMECA Arriel 2D engine equipped with a dual channel Full Authority Digital Engine Control (FADEC®)system this world altitude record holder (Mount Everest, 8,850m, May 2005) can perform extreme combat flight in high and hot conditions (The AS550 C3e is fully operational from the highest altitudes - 7,000 m / 23,000 ft- to the hottest sandy environments - + 50°C / 122°F). Its Vehicle and Engine Multifunction Display (VEMD®) provides accurate information concerning the performance and condition of aircraft, dramatically reducing the crew’s workload. 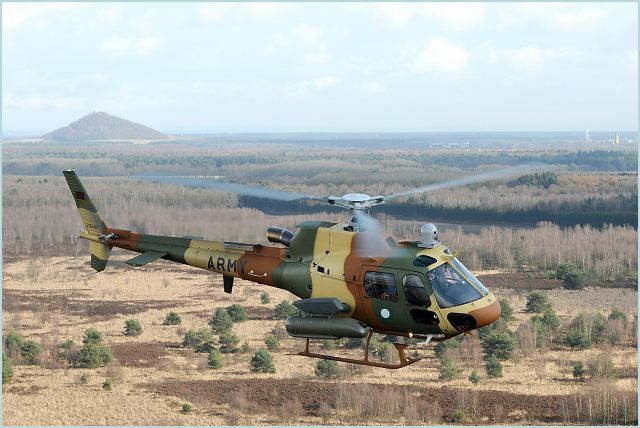 The AS550 Fennec can be fitted with a wide range of weapon systems to suit the operational requirements of the country's forces. Weapon fits include anti-tank missiles, rockets or guns. 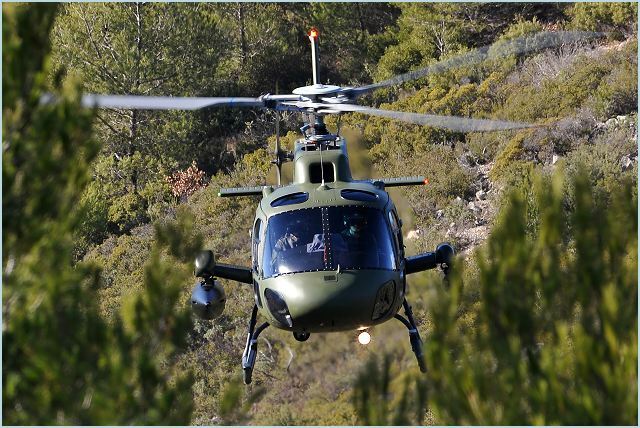 The Danish Army AS550C2 helicopters are armed with the Systems & Electronics (formerly ESCO) HeliTOW sighting system and TOW anti-tank missiles. 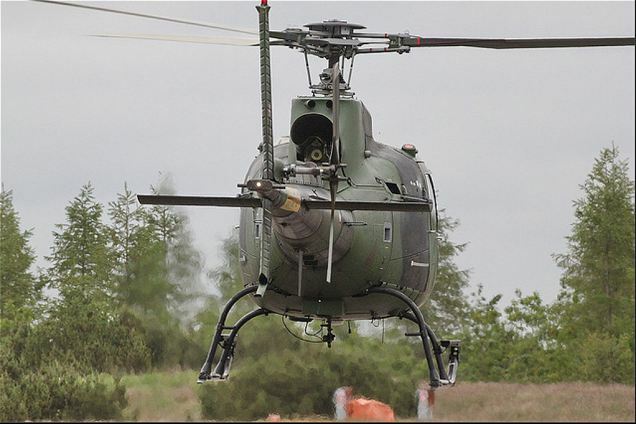 The HeliTOW sight is roof-mounted and contains direct view optics, day and/or night sight and laser rangefinder. Argentina, Brazil, Colombia, Denmark, France, Malaysia, Mexico, Pakistan, Thailand. Controls and night vision, GPS, VHF omnidirectional radio ranger, instrument landing system (VOR/ILS), an automatic direction finder (ADF), distance measuring equipment (DME) and a marker beacon transponder.